This Post has already been read 1209 times. 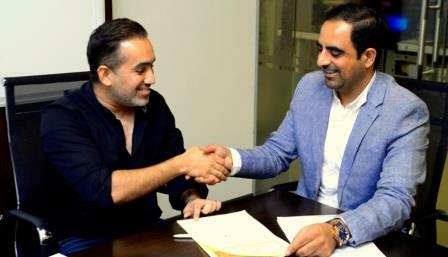 Pakistan’s largest real estate portal Zameen.com and top real estate developer Ace Works (Pvt) Ltd have signed an exclusive sales and marketing agreement for Riverwalk, Islamabad, the latter’s upcoming high-end apartment project on the banks of the Soan River. The agreement was signed at Zameen.com’s head office on MM Alam Road, Lahore with Ace Works (Pvt) Ltd represented by CEO Usman Zafar Cheema. Riverwalk, located in one of the most picturesque districts of the federal capital, offers luxury apartments at affordable rates. The five-storey apartment complex, overlooking the Soan River, is situated on Islamabad Express Highway a mere five kilometres from Airport Chowk. “The ever-growing number of projects that are seeking Zameen.com’s services for exclusive sales and marketing is heartening,” said Zameen.com Director Business Development Laeeque Iftikhar. “Being the largest online medium for Pakistani property, our reach extends around the world and we’re the most trusted avenue for real estate transactions for Pakistanis everywhere, which gives us the edge when it comes to property deals,” he added. Zameen.com is currently exclusively marketing 4 projects in Lahore and Riverwalk is its first Islamabad-based project.